Our Waters	| Attention: Bair Island & Corkscrew Slough Status! Here are a few brief descriptions of sweep rowing and sculling, recommended clothes, and power snacks. For more detailed information on coxswain commands and boats, see our Rowing Terminology or print a copy of it as a PDF (includes details about boats and coxswain commands). Sweep rowing. Each rower uses both hands on a single long blade and rows on one side of the boat. Sculling. The rower has a hand on each of two shorter blades and rows on both sides of the shell. Many members are involved in both kinds of rowing as well as paddling. BIAC's crew teams offer opportunities for coached practices and racing in both sweep and sculling. We run and attend races throughout the year. 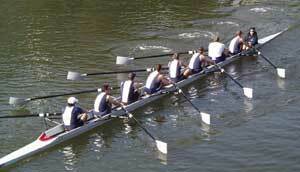 Most scullers go out in singles (one-person boats, denoted as 1x) or doubles (two-person boats, denoted as 2x). BIAC also has several 4x (quad) shells. The x indicates the absence of a coxswain, the helmsman and in-boat coach. For more information on sculling, see Mike Sullivan's Sculling Manual. Most sweep rowers practice in boats with four or 8 rowers, plus a coxswain to steer (these are denoted as 4+ and 8+; the + indicates the coxswain). The rowing machines (ergometers) seen in health clubs are great for practicing correct rowing motion and for physical conditioning, but give no sense of the balance, timing, or synchronized oar bladework required on the water. This is a sport that demands both individual and team excellence. At BIAC, rowers take turns serving as coxswains (or simply coxes). First-timers should read read our guide to coxing: Coxing 101. We recommend comfortable yet close-fitting workout clothing. Anything loose or baggy can get caught in the sliding seat or an oar handle. In colder weather, dress in layers so you can shed a layer when warm and put it back on when cooling down or if the weather turns. ​Modern cycling gear works well on the water, as it is close-fitting, is highly visible, breathes, wicks away moisture and protects against the elements. You won't wear shoes on the water, but you need some that can get wet and offer good traction when carrying boats to and from the docks. You will also need a water bottle and, optionally, a hat, sunglasses and sunscreen. Scullers may find a cycling rear-view mirror a convenient safety aid. One recommendation is to eat about 200 calories of whole grains and fruit an hour or more before exercise. Drink water before, during, and after exercise to stay hydrated. Many people can lose a pint of fluid per 1/2 hour of hard exercise.